Judy's Doll Shop | Sophia's - Everyday Friends Collection - "Miley"
Sophia's - Everyday Friends Collection - "Miley"
New from Sophia's Everyday Friends Collection, these 18 inch dolls are all vinyl with long rooted hair. 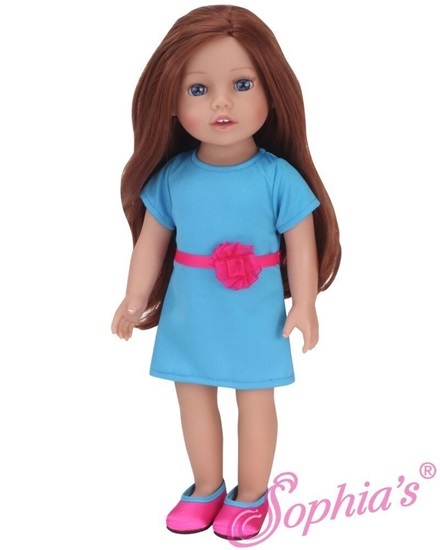 Meet "Miley" an 18 inch all vinyl doll from Sophia's Everyday Friends Collection. Miley has an all vinyl body. Her head, torso, legs and arms are all vinyl. She has long auburn hair that is rooted, and blue eyes with stationary eyelashes. She is dressed in a turquoise blue sheath dress with a contrasting hot pink ribbon belt. Matching shoes complete her ensemble. "Miley" is perfect for ages 3 and up and comes in a brightly colored window box.